Asyril offers high performance flexible feeding systems for parts and components up to 40mm in size. Their innovative technology can handle bulk parts of any geometry and allows for extremely gentle part feeding. Asycube flexible 3-axis vibration feeders offers high performance part feeding, pre-orientation and optimal surface distribution of bulk parts and components. 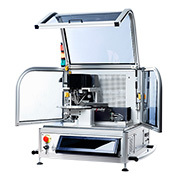 Asycube 530- Offers optimal part feeding, orientation and surface distribution for parts and components from 30 to 150mm. SmartSight describes Asyril’s intelligent optical part detection and image processing system, ensuring straightforward integration of any Asycube vibrating platform with any industrial robot brand. SmartSight comprises Asyril’s powerful visual part detection software, an industrial control PC as well as an optimally configured vision kit including camera, objective and all necessary cabling, SmartSight makes the implementation of high performance flexible feeding systems as simple as setting up conventional feeders. Asyfeed Pocket easy-to-integrate feeding system capable of supplying a large variety of products and materials. The Feeding System can handle parts smaller than 0.1mm and up to 10mm in size and has proven its reliability and efficiency in various applications such as watchmaking, medical products and electronics. Optimally combining an Asycube vibrating platform with a high performance visual- and integrated robotics system, the Module can be easily configured and integrated into any automated production line through Asyril’s Feeder Control Center software. Asyril's integrated flexible palettizing station is a compact tabletop-system for the fast and precise sorting, palletizing and assembly of small parts from 0.1mm up to 15mm provided as bulk goods. The Asyfeed Cell workstation incorporates a complete Asyfeed Pocket Module as well as fully configurable process working space that can be equipped with various client-specific elements. Typical cell configurations contain for example different part trays, pallets or tubes, a rotary indexing table or a second camera for quality control/inspection of the parts. Asyril's intuitive Feeder Control Center Software allows for fast setup and changeover times, multi-user capability, as well as GUI-based programming and configuration of the system for new parts. R.R.Floody Company is an Asyril flexible feeder distributor in Northern Illinois, Iowa and Southern Wisconsin. We offer technical support to help our customers solve their applications.